As Director of Coaching and Head Coach of Mini Footie Football Academy, I have a strong belief in the importance of introducing sport into our children’s lives from an early age. Sport is fundamental to the health and wellbeing of young children: as well as developing key skills such as co-ordination and concentration, it also builds a child’s self esteem and confidence and creates an early understanding of teamwork and discipline. Developed around the ever-loved game of football, the Mini Footie Football Academy training sessions bring together the necessary skills and knowledge to deliver a complete programme specifically developed for the different age-groups. All of Mini Footie Football Academy’s venues provide a safe, secure and stimulating environment to enhance the enjoyment for children and assure peace of mind for parents. 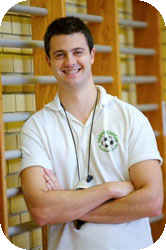 All of the coaches working for the Mini Footie Football Academy are FA qualified and CRB checked. The coaches are able to answer your questions and concerns, or alternatively you can contact me directly at adam@minifootie.co.uk. We are confident that your child will have an enjoyable and memorable time while being a member of our Academy. The experience will give them a sound basis on which to build their love for sport, be it through football or another discipline.